OK, triathlete friends: Can we talk about transitions? I practiced my first-ever transition on Sunday, when I did a trial run-swim-run ahead of the Allen Stone Run-Swim-Run on July 21. I swam in my Nike two-piece suit, which worked brilliantly. 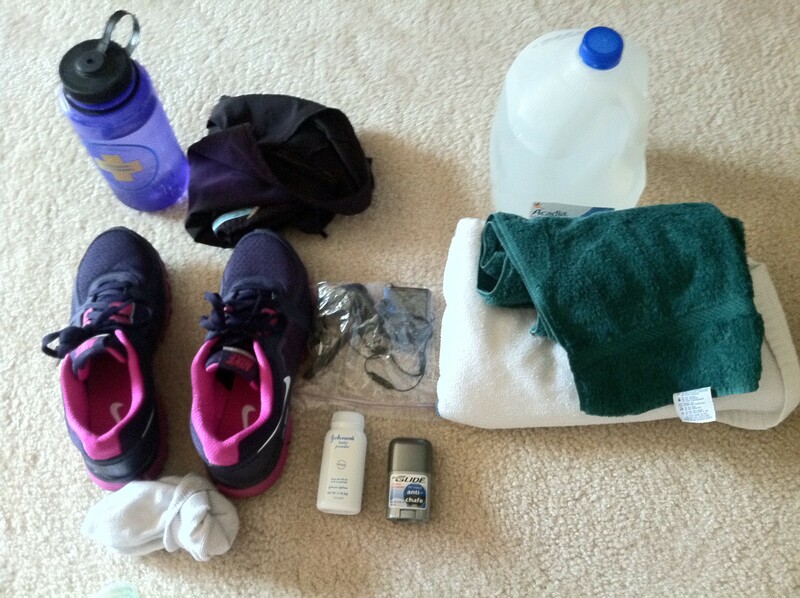 I laid out my least chafe-prone shorts with my running shoes, a gallon of water and towels to wash the sand off my feet, and some baby powder to dab on my feet to get rid of remaining moisture, all of which made me feel completely comfortable on the run. The only problem: The process took me five minutes. Gah! Is that just how these things go? Are there any tricks to make it quicker? Am I missing anything from my “transition kit,” pictured below? Help! Here are my tips- put the powder in your shoes beforehand, don’t waste time with socks (really, it’s not bad) and get some stretchy laces. I recommend putting the water in something smaller and with a wide mouth like a nalgene. It is easier to dump onto your feet. I am so jealous of your upcoming race, I did a Swim/Run Aquathlon a few weeks ago and loved it! It’s my ideal race. Good luck! These are SUCH good tips! I’ll try a sockless trial-run sometime this week. Thanks for weighing in! I wore shorts for the run of my my swim/run only because it was the easiest way to get my race # on quickly because I knew a race belt would chafe without shorts on. Oh, the difficulties of multisport! I agree with runninarounduptown, swim in your shorts! At tri’s I wear my entire race outfit under my wetsuit so that the only things I put on in T1 are bike shoes and helmet. And since you’re not riding a bike, I would go with plain old compression shorts instead of tri shorts. No padding whatsoever, plus if you get a ‘longish’ pair then you don’t have to worry about inner-thigh rubbing (if you are like me and are prone to that). Ditching the socks is a great idea too. This should all take 2 mins off your transition time. Good luck! Have a great race! Sounds like you’re all set!! if I was doing a swim/run race, I would swim in a bathing suit and then run in a bathing suit. or swim in a tri suit and then run in a tri suit. but probably #1. body glide the inside of your socks before you leave them in transition. socks, shoes, on, go. leave a towel in transition to step on but don’t worry about wiping your feet (unless you are running a marathon a little bit of sand won’t kill you). that is what I would do (not necessarily the right thing, but, well, there it is). These are all JUST EXACTLY the kind of posts I wanted: Insights from people for whom this stuff is such second nature, the first sentences of the response are: Ohhhh, honey. Bless your heart. THANKS, all, for the great advice!